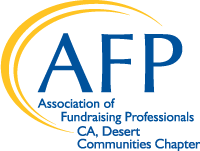 The CA, Desert Communities Chapter of the Association of Fundraising Professionals is excited to add a new member benefit to our already valued-laced programs. In this program we match a seasoned professional “Mentor” with an individual who is new to fundraising (Mentee). This partnership will benefit both individuals as well as the nonprofit organization for which the Mentee works. Attached please find the document that explains the program and both applications. To participate as Mentor or Mentee, please send an email. This will give the committee time to review the applications and notify selected participants. Click Here for the Mentor Application - and Here for the Mentee Application. Together we help each other!